Indoor Air Quality (IAQ) refers to the quality of the air we make contact with and breathe inside of buildings. A focus of building sciences is to design and engineer buildings that provide a comfortable and healthy environment for their occupants. This can be accomplished by minimizing indoor pollutants, maintaining comfortable temperatures, and limiting excessive humidity. 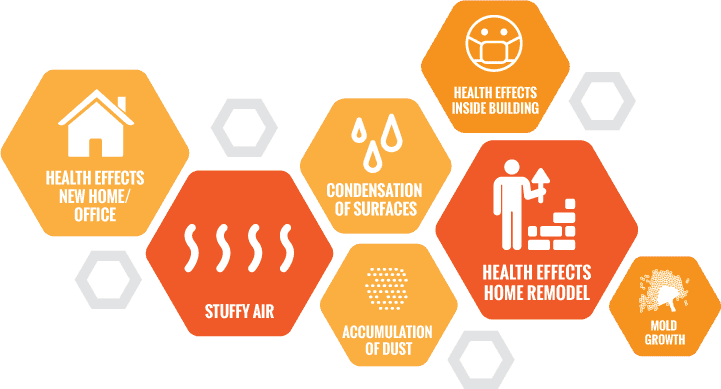 Health effects from poor indoor air quality may be felt immediately or manifest themselves slowly over years. Some common effects may include irritation (eyes, nose, and throat), headaches, dizziness, and fatigue. Although less common, long-term effects may include diseases that affect the lungs/skin/heart and cancer. Test for indoor pollutants (Mold, Bacteria, Animal/Plant parts and by-products, Volatile Organic Compounds, Carbon Dioxide and Carbon Monoxide, Lead, Asbestos, Radon, etc.). Most of the concerns that our customers talk to us about deal with water damage and mold growth. For more information on mold and mold related services please click on the following page link: www.fsginspections.com/mold-related-services When we perform a mold assessment we also document observable moisture problems, temperature, and humidity. We have the capabilities to monitor and data log temperature, humidity, Carbon Dioxide, and Carbon Monoxide over time with the use of data loggers. This can allow for possible trends to surface, which may shed light on transient indoor air quality problems. Please give us a call so we can understand what you need regarding data logging and provide you with a proposal for services. If you need another variable monitored and data logged give us a call and we may be able accommodate. We can perform testing for Volatile Organic Compounds using a suma canister and EPA TO-15. We primarily do this testing for business and industrial applications when a business or the government want to see if Occupational Safety and Health Administration (OSHA) Permissible Exposure Limits (PELs) or National Institute for Occupational Safety and Health (NIOSH) Recommended Exposure Limits (RELs) have been surpassed or if certain chemicals are identified on the test results. EPA TO-15 results are usually too technical for a homeowner to get actionable information from because many household cleaners contain a variety of chemicals. We can test for pollen, animal dander, dust mites, and many other indoor pollutants. Please give us a call so we may understand your needs and provide you a proposal for services. We do not perform radon, lead, or asbestos testing. If you have concerns about any of those pollutants please give us a call and we may be able to direct you to some local resources that perform those types of testing. If you would like to test for radon yourself or lead yourself, you can buy kits online or locally at EMSL Analytical in Orlando. Please keep in mind that there are advantages to hiring state licensed Asbestos, Radon, and Lead Assessors. A licensed professional can review your home and formulate a strategy for their work and testing locations. They can also give you personalized information and guidance that you may not get from a laboratory analysis alone.